15th March 2013. All new features on the My Home tab, February's $100 Shop voucher winner, complete the ExplorOz survery to win, plus our Members only special continues, get ready for Easter with Explore Australia, and view our latest Super Specials. Upgrades to the My Home tab now make it even easier for you to keep track of your activities on ExplorOz. Here's the run down on what's new for this very useful tool, which is available to both Members and registered Visitors. The My Home tab is found on the grey toolbar present at the top of every ExplorOz page (next to My Details). If you are a Member, you will also have a My Profile tab shown. The My Home Tab is designed to keep a record of your interactions with the site, as well as giving you a quick glance at what is new since you last visited - find out more here. This week, the My Orders and My Classifieds functions were added to this tab, allowing you to access information on both new and previous Shop orders and Classifieds ads. Click on the View button for My Orders and you can access a list of all orders, as well as payment and dispatch dates, freight method and tracking details. Click on View in My Classifieds to access and edit your current ads, as well as to view and reactivate expired ads. Survey Series - Tell Us What You Want! Over the upcoming months, ExplorOz will be releasing a series of surveys to gauge what our audience wants and currently finds useful, both on ExplorOz and more broadly within the travelling community. This will shape the content, tools and products available on ExplorOz for the near future, so don't be shy, tell us what you want! The first survey relates to how you use & feel about the services we currently offer, and should only take approx. five minutes to complete. 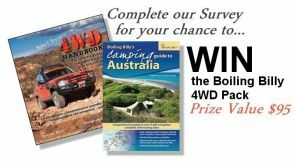 And as a bonus, complete the survey to go into the draw to win a Boiling Billy 4WD Pack, valued at $95 (see right for further details). Thanks to all of you that remember to submit your reviews of products you've recently purchased. There will be another prize draw for March reviews, but remember you've gotta be in it, to win it! Don't miss out on this exclusive offer - for a limited time you'll receive a free copy of Australia’s Best Eco-friendly Holidays when you purchase any Explore Australia title from the ExplorOz Shop. There's a great selection of books to choose from - view the range. The confirmation emails that are sent to Members who have just renewed have been updated, and no longer contain your login details. Now, if you forget these details, the only way to receive them via email (if you are currently registered as a visitor or member) is to use the Forgot Password button on the Login tab. 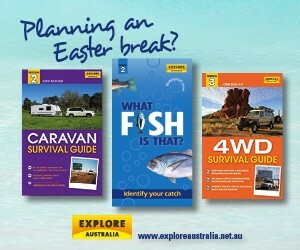 Get set-up for Easter & the Outback travel season. 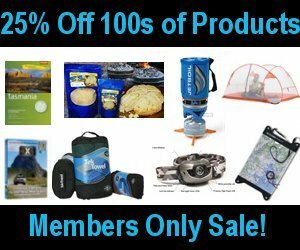 View the full range of discounts.